Teaching and supporting writing in the English/Language Arts classroom can no longer be about the basics of subject, purpose, and audience. It is clear from my research that today’s adolescents need writing tasks with which they can engage on a personal level as their own emerging identities evolve and change. While writing needs to have an academic focus and purpose in terms of content knowledge development, it can and should be a means of articulating one’s personal identity within the larger context created and supported by the material being studied. Furthermore, it is not enough to simply incorporate technology into daily lessons. While in the more traditional sense technology is a tool with which students create written products, it is also the means by which our digital natives introduce their narratives to the “real world,” inviting the scrutiny of peers and teacher, so it must intersect with the larger social and cultural milieu in which our students find and place themselves. According to Thomas DeVere Wolsey and Dana L. Grisham, “rapidly evolving digital technologies…present new opportunities and new challenges for our millennial-generation writers. Adolescents form personal and social identities throughout middle and high school, and the millennial generation illustrates this through the social networking tools they use. [They] may partially construct these identities in a writing community. More important, technology can help with content-learning task and identity construction” (p.xiv). 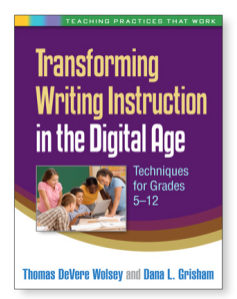 In their chapter titled “Why Writing is a Process, and How Technology Can Help,” Wolsey and Grisham explain that when students are “challenged with knowledge transforming tasks” instead of those writing tasks that simply require them to tell what they have just learned, students will “become comfortable with the back and forth of writing that means that the first draft may not be the best one” (p.xiv). When writing tasks are carefully crafted in a way that steers clear of “knowledge telling,” students are more inclined to participate in the editing and revision process. Furthermore, “writing is more engaging when the author has access to useful feedback” (p.39). This comfort with the feedback and editing process can then have the capacity to increase student confidence because there is not merely one correct way to express one’s thoughts, and not merely one correct answer. Wolsey and Grisham caution that “the cognitive work required in transforming knowledge through writing is difficult and challenging,” (p.40), but they also assure that “student proficiency develops with time.” Digital tools allow for copious feedback at multiple points in the writing process from both peers and teacher, further lowering student anxiety by emphasizing the “draft” nature of the students texts. 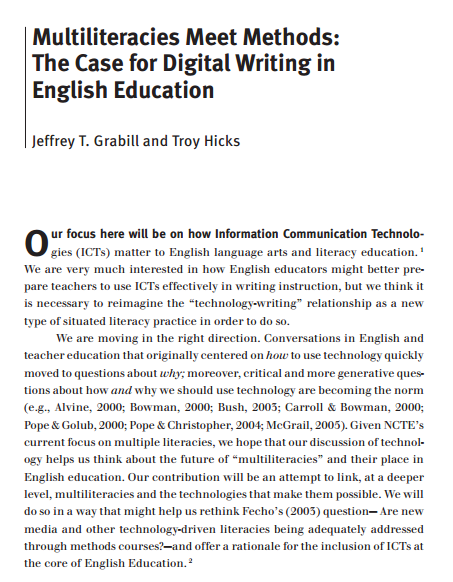 Jeffrey T. Grabill and Troy Hicks (2005) in their article published in English Education, offer a basis for including Information Communication Technologies (ICTs) in teacher preparation courses. They argue that if the goal of teacher preparation courses is to help students be more effective writers, then those courses will have to envision the purpose and process of writing in the same ways that students do. Furthermore, within the realm of the internet emerging social and cultural spaces and literacies are rapidly evolving, underscoring the need for and importance of preparing pre-service and in-service teachers for not just planning “technology-rich literacy activities” for their own students, but they too must participate in these activities and the spaces they create. What it means to be literate is changing, and teacher education and training needs to prepare us to participate in this change. 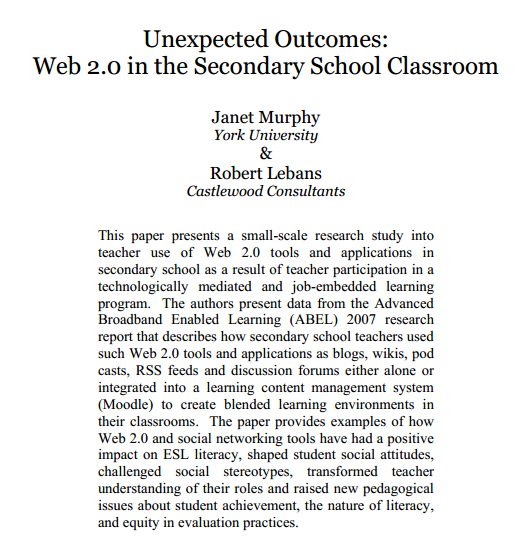 Murphy and Lebans (2008) investigated the positive impact of the use of Web 2.0 tools in the secondary school classroom. Part of their research focused on the benefits realized by English learner and immigrant student populations. Specifically, teachers of these target populations reported that student enthusiasm and engagement was greatly enhanced and they were “gratified by the impact…of Web 2.0 tools on written literacy and student attitudes to language use” (142). Specific improvement was noticed for students who would not have ordinarily participated in a class discussion, but did so in online blogs and other forums. Student writing was carefully crafted, and it also provided an opportunity for the teacher to identify and target specific areas of writing difficulty and plan and deliver instruction appropriately. Incorporating and utilizing digital writing tools in the ELA classroom requires an understanding of and comfort with utilizing the many opportunities for response and feedback during the writing process. Allen Teng (2012) in an article published in Voices from the Middle notes that technology can “expedite” the feedback that good writing requires. He explains that “the comments, feedback, shoutouts, and general response from others, typically their friends, are what have students rushing home to check their email notifications” (p.36). His remarks underscore the fact that our students are highly interested in audience, but it is an interest that cannot be sustained if writing is only done for the teacher. 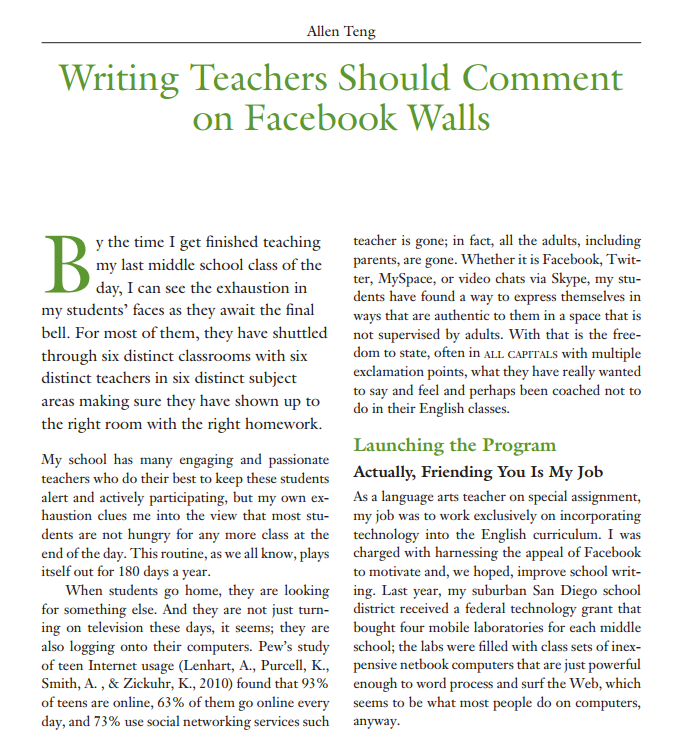 Teng’s article focuses on his school’s launch of a Facebook-like social network to be used in an attempt to improve student writing. He notes that for students “writing informally online provided them a freedom that they rarely had in classes. Voice mattered. Response mattered” (p.34). He goes on to explain that in the language arts classroom it would be best to consider social network postings as pre-writing activities, and that we are still tasked with helping students move from pre-writing to polished drafts. It seems, however, that these social network opportunities may be a powerful way to help build student confidence and enthusiasm for more formal writing tasks.